TALLAHASSEE – Youth cigarette smoking rates in Florida are at an all-time low according to new data released on Tuesday by the Florida Department of Health. 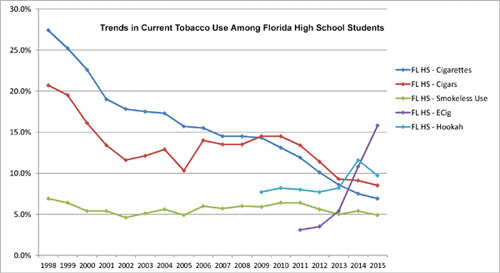 Conventional cigarette use among Florida high school students dropped from 8.6 percent in 2013* to 6.9 percent in 2015 – a 19.7 percent change. 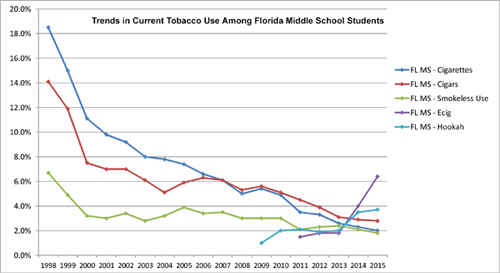 The Florida Youth Tobacco Survey (FYTS) also showed declines in other combustible and traditional smokeless products. This new report also marks another important, but more troubling trend. Current e-cigarette use among high school students has increased – from 5.4 percent in 2013 to 15.8 percent in 2015. Hookah use among high school students has also increased, from 8.2 percent in 2013 to 9.7 percent in 2015. Since 2009, when FYTS began tracking current hookah use, the rate has increased 26 percent. Issued annually since 1998, the FYTS report data is weighted to represent the entire population of Florida public middle school and high school students. Since Tobacco Free Florida launched in 2007, the current cigarette smoking rate among Florida youth, ages 11 to 17, decreased by 62.4 percent – from 10.1 percent in 2007 to 3.8 percent in 2015. Current use means at least once during the past 30 days. In 2015, 22.9 percent of high school students reported ever trying a cigarette, a 43.7 percent decrease since 2007. In 2015, 8.5 percent of high school students reported current cigar use, a 37.7 percent decrease since 2007. In just two years, the number of Florida youth who reported ever trying e-cigarettes tripled from 4.3 percent in 2013 to 14.7 percent in 2015 among middle school students, and from 12.1 percent in 2013 to 37.6 percent in 2015 among high school students. Tobacco Free Florida and the Florida Department of Health have had a watchful eye on e-cigarettes since they emerged. The department is awaiting regulation and guidance from the Food and Drug Administration as the agency works to establish their regulation of e-cigarettes. The department’s Tobacco Free Florida campaign is a statewide cessation and prevention campaign funded by Florida’s tobacco settlement fund. Tobacco users interested in quitting are encouraged to use one of the state’s three ways to quit. Since 2007, more than 126,140 Floridians have successfully quit, using one of these free services. To learn more about Tobacco Free Florida and the state’s free quit resources, visit www.tobaccofreeflorida.com or follow the campaign on Facebook.